From 1982: a chance to own STAR WARS: A NEW HOPE on home video (if you somehow neglected to tape it when it was on ITV in October) for a mere fifty quid (plus postage). At that sort of price, I'd rather watch the TV outing and fast-forward through the commercials (assuming you didn't hit 'pause' every time they went to a break during the recording). This was, of course, before the concept of sell-through had become established... opening up another revenue stream for the studios (a release window after rental... but before the free-to-air TV premiere). From 1983: THE A-TEAM, by Charles Heath, published by Target Books. 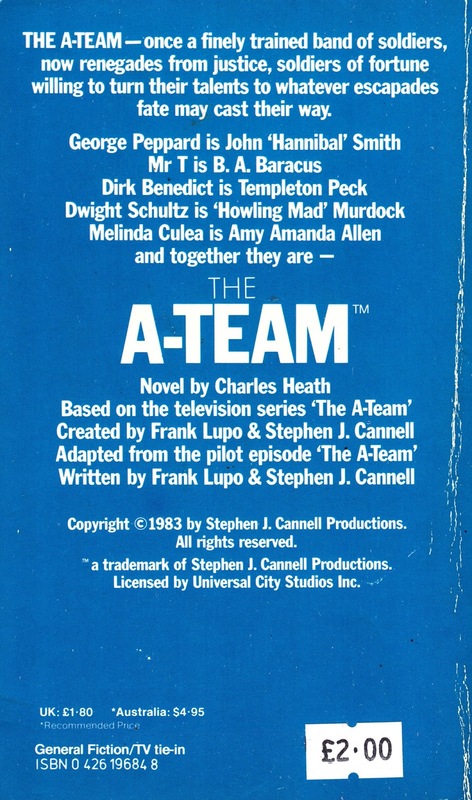 One of the Star Age things that's been all-but -eradicated by the digital age (although i suspect the rise of VHS was an early nail in the coffin) are novelizations of pretty much any film of TV show that looked like it might shift a few pulpy paperbacks. Target Books, long time publishers of the DOCTOR WHO range, decided to hedge their bets in the early Eighties and start publishing books based on imported US action shows. 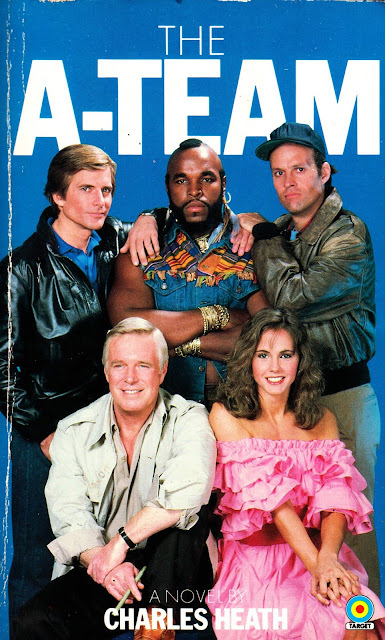 Ironically, THE A-TEAM was thrashing the pants off WHO in the Saturday night schedules at this point. The US editions of the these books came courtesy of Dell although it seems like Target kept the faith longer as they managed several additional outings that didn't see US release. THE A-TEAM was, at least for a while, red hot on both sides of the Atlantic. Target managed to eek out at least ten paperbacks adapting various episodes. And they also indulged in some brand extension with at least a few Choose-Your-Own-Adventure type outings. This first book in the series (no number... presumably because Target weren't confident they had a franchise on their hands) adapts Mexican Slayride, the show's feature-length first outing. Despite the bog-standard cast publicity photo on the cover, Dirk Benedict (Face!) didn't actually appear in the episode. Tim (Captain Power) Dunigan had the honors but looked too young to be convincing as a Vietnam vet. Benedict stepped in from the second episode and no effort was made to remount the pilot (presumably on the grounds of cost and time). I've not read the book but I do have a soft spot for the show itself. It's easy to dismiss as being repetitive and not very clever but, watching as an adult, it's easy to see Stephen J. Cannell's light touch shining through and elevating the material. The cast are also uniformly excellent (Bennedict is basically channeling Starbuck... which makes the Cylon gag from the episode Steel even more fun), especially Dwight Schultz as Murdoch. He brings the right charm and manic energy without pushing it OTT and into the please-get-off-the-screen zone. 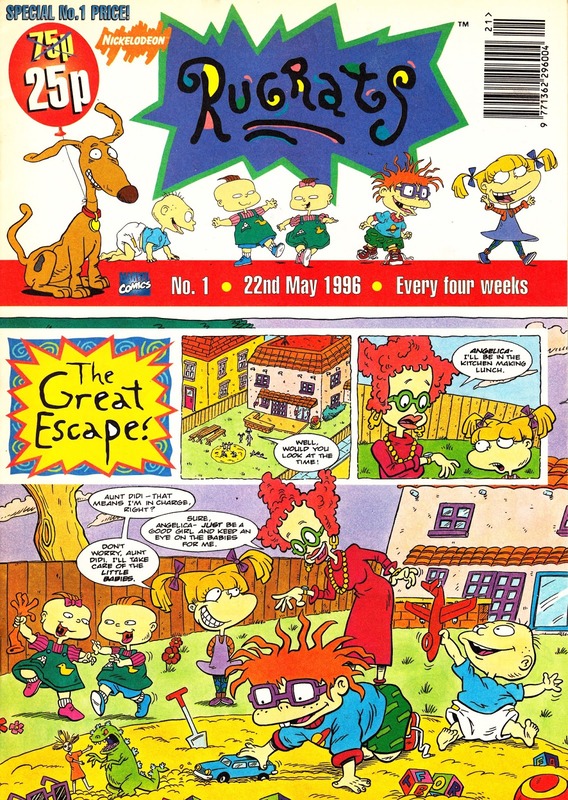 From May 1996: the first issue of MARVEL UK's RUGRATS weekly, based (of course) on the animated series. It's an eye-catching front cover... except for the gotta-go-somewhere barcode. Oopsie. This would have been one of the final launches to come out of the Annex Of Ideas before Marvel's acute financial woes forced the sale of their Panini subsidiary... including the British Bullpen. I think I managed to catch episodes of the series twice... and both times it turned out to be the same episode! A testament to the BBC's commitment to value for money by playing the same cartoons until the tapes wore out. From October 1982: MARVEL UK's SPIDER-MAN (the first time that simple-and-to-the-point title was used on the UK weekly) issue 500. I'm sure I've posted this celebratory issue before (500 issues is nothing to be sniffed at) but I recently stumbled across a copy with the free metal pin badge still attached. And it only cost me a pound. 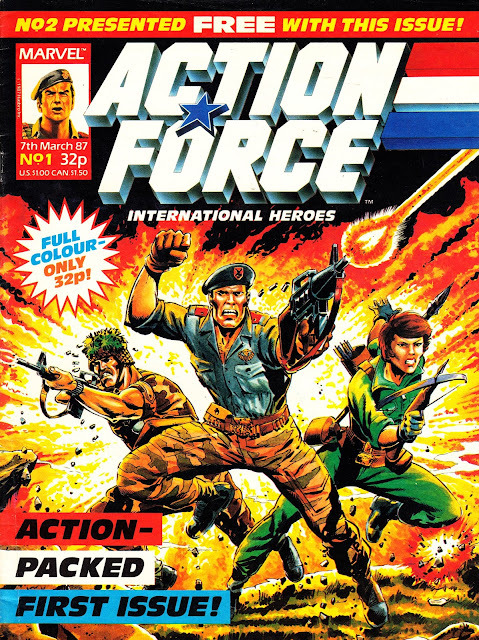 From March 1987: the first issue of MARVEL UK's new ACTION FORCE weekly. 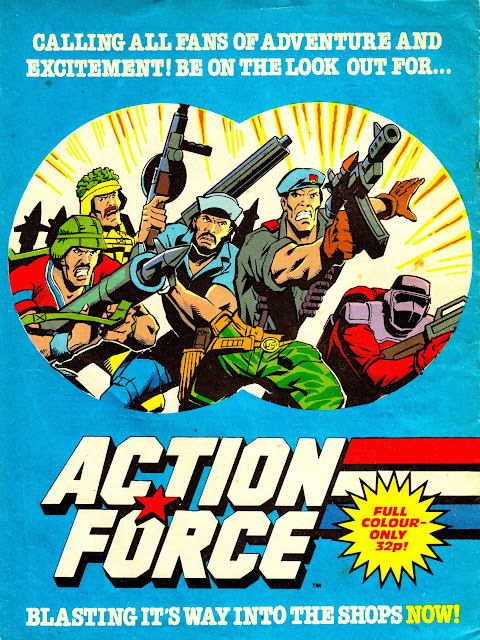 This glossy, 24-page opener (accompanied by the second issue... a launch strategy never repeated... possibly because if you missed the first one then the next available jumping-on point was the third issue... possibly a disincentive to would-be readers) was certainly a blast after years of IPC's relatively low-rent treatment of the license in the pages of BATTLE ACTION FORCE (although, in retrospect, there's a lot of good stuff to be found therein and its a real shame that the chances of an official re-release are near to zero). Most issues had a three-strip line-up: a new British strip (primarily used to align the weekly with whatever toy Hasbro were currently trying to shift through TV and print advertising), heavily edited (to create a unique British continuity pegged to the main strip) reprints from the core G.I. JOE book (hitherto unseen in the UK outside comic book stores) and a third feature which, in typical Marvel fashion, bounced around a bit (Masters of Kung Fu, now integrated in to AF continuity, popped-up at one point). The new license and publisher was part of the fallout from structural changes in the British toy industry. Palitoy, creators of Action Force, had shuttered and the brand transferred to Hasbro, the maker of G.I. JOE. Action Force, after a strong independent start, had essentially already morphed into a British interpretation of JOE anyway. Hasbro used the relaunch as a chance to apply their glossy marketing muscle (including key art, box art, slick TV advertising and episodes of the Marvel made TV show) to the line. The British Bullpen were already publishing THE TRANSFORMERS and had a strong relationship with Hasbro through their US parent (who, on both coasts, were heavily involved in several of Hasbro's lines of the time) so it was a no-brainer that the license would shift from Kings Reach Tower to Redan Place. 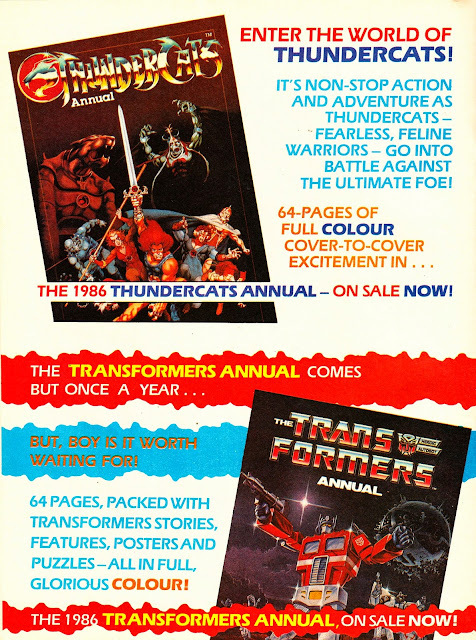 The existing Transformers weekly was used to prime readers for the impending launch of this title and, throughout the year that AF appeared, crossovers and other plugs were a regular feature. I think this launch issue revived the old British tradition of hyping a new title with a TV advert. It rings a very strong bell. Can anyone confirm? Hasbro were certainly plugging the toys in a series of spots that utilized animation (from Marvel Productions) originally created for either US advertising or the TV show itself. The US JOE book had benefited from commercials, bankrolled by the toy company, who used them as a handy way of circumventing strict toy advertising rules by plugging the comic... which just happened to feature whatever toy they wanted to shift in any particular season. The AF weekly ultimately only notched up a paltry fifty issues. A quite surprising failure considering the quality of the product and the corporate backing for the brand. Presumably the changes in the British comic industry conspired to make it too difficult to gain traction. The franchise bounced back with a US-format monthly which benefited from distribution in the States under the alternate title of G.I. JOE EUROPEAN MISSIONS. The reprints of the core JOE title shuffled to THE TRANSFORMERS (apparently much to the disappointment of Simon Furman who favored using the slot to showcase a revolving door of reprints) and reprints from G.I. JOE SPECIAL MISSIONS were slotted into the short-lived THE INCREDIBLE HULK PRESENTS in 1989. From February 1989: Issue 62 of the pro-zine DWB, edited and published by Gary Levy (aka Gary Leigh). Launched as DOCTOR WHO BULLETIN circa 1983, DWB went from strength-to-strength throughout the Eighties and had become one of the preeminent zines by the end of the decade. However, its success, and antagonistic attitude to the show, its producer and BBC, made it a sitting target for BBC Enterprises to try and shut it down. It's success, and relatively high production values, meant that it could easy encroach on the officially licensed DOCTOR WHO MAGAZINE. So, although WHO remained dominant, Levy/ Leigh switched gears at the end of the decade and relaunched it as (subtle difference) DREAMWATCH BULLETIN with a remit to cover a much broader range of shows. This may have also been partially prompted by boredom on Levy/ Leigh's part. The declining fortunes of the show, and the number of episodes being shot, certainly gave less scope to cover current production. It's also possible that he guessed/ was told that the show's days were numbered and wanted to broaden the scope to ease the transition. I picked this issue up quite recently but I started reading regularly later in 1989 anyway and I still have my collection stashed in a box somewhere. DWB was always a compelling read, particularly because of its vitriolic hatred of John Nathan-Turner and his interpretation of the show. With the benefit of hindsight, it's amusing (and slightly distasteful) to see how much venom was unleashed. JNT was, afterall, a jobbing BBC producer fighting against a tide of indifference and restructuring. Neither of which favored him or his show. The motivation for Levy's attitude can be found in the pages of the excellent THE LIFE AND SCANDALOUS TIMES OF JOHN NATHAN-TURNER by Richard Marson. 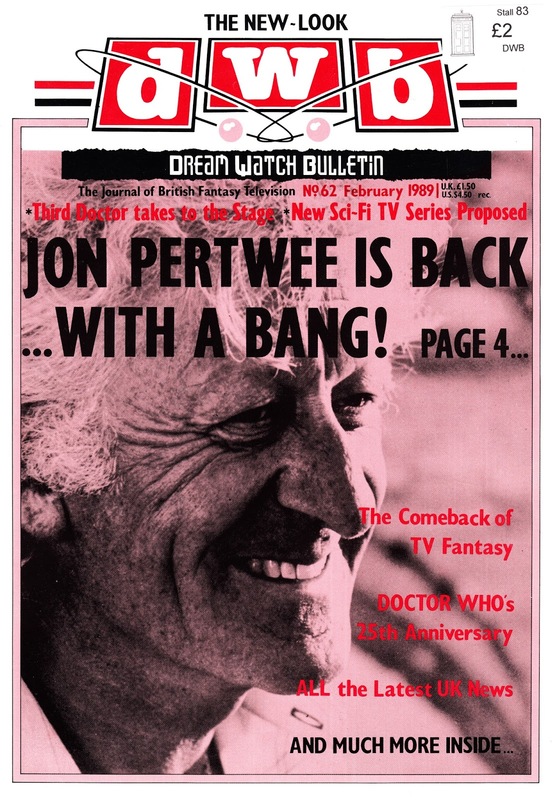 DWB was relaunched as DREAMWATCH (it was never as good) and subsequently acquired by Titan. It's now defunct. 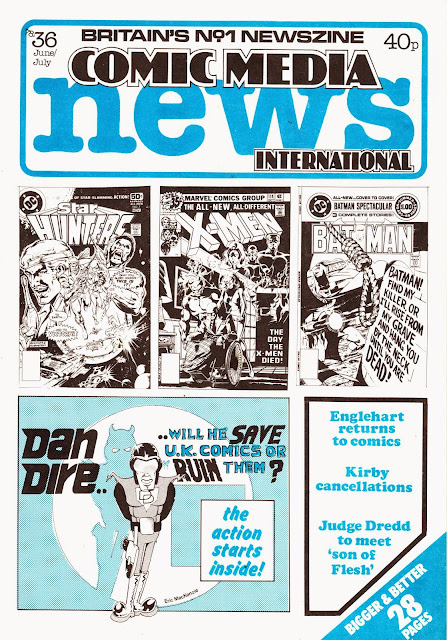 A semi-random scan from June 1978: COMIC MEDIA NEWS INTERNATIONAL issue 36, edited and published by Richard (Burt) Burton... future staffer at the Annex of Ideas and Tharg's Command Module. 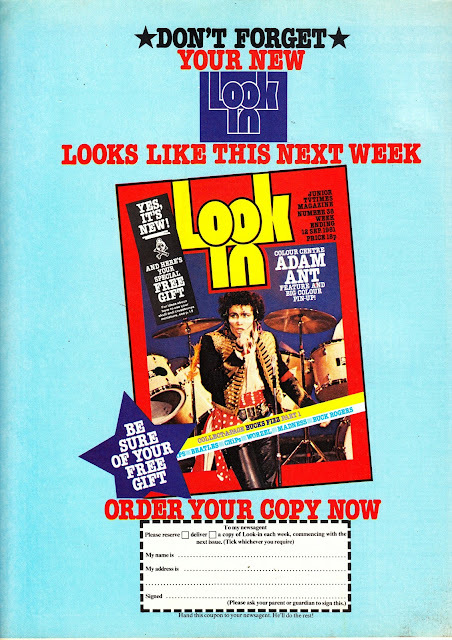 From October 1982: A fascinating issue of ITV's LOOK-IN. It's ridiculously hard to emphasis what a massively big deal the TV premiere of STAR WARS was. Almost five years after its British theatrical premiere (just after Christmas 1977), it was finally coming to the small screen. It had been a long wait. I'm not even sure whether it had been released (officially) on home video at this point but, even it is was, it was strictly rental only. The affordable sell-through market was still a few years away. 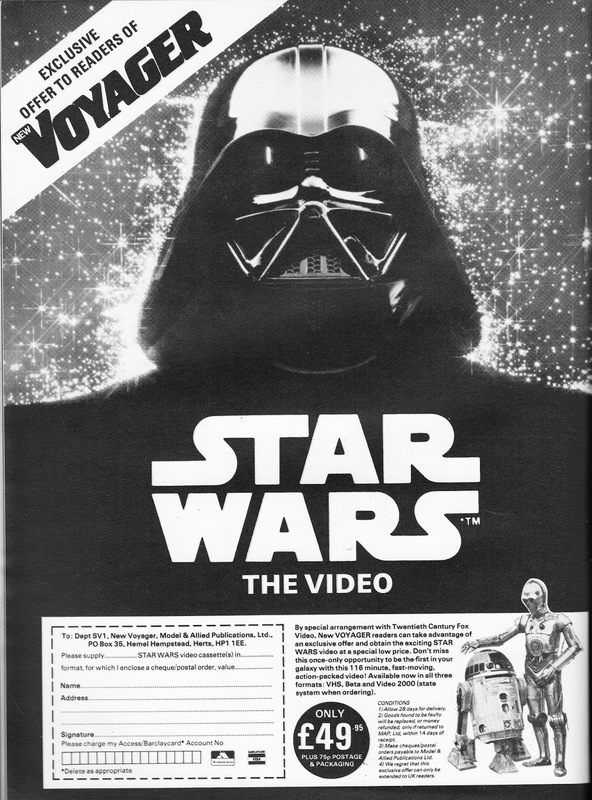 How many families bought or rented a VCR simply to record and keep Star Wars? Or borrowed the school, college or workplace machine (assuming it was bolted to a hefty trolly) for the weekend? Why didn't ITV make it their big Christmas Day film? Ad space is in higher demand in the pre-Christmas sales period so ITV could charge a premium for ads in highly-rated programmes in the final three months of the year. Christmas Day films could command huge audiences... but generated less income because the gift buying season was over. But... there were other delights that weekend as well. ITV also premiered (with considerably less fanfare) the first episode of STAR FLEET, the legendary puppet SF show from Japan. From the opening theme and the first few minutes, it was obvious that this adventure serial was something special. And it was. It became essential viewing throughout the run. 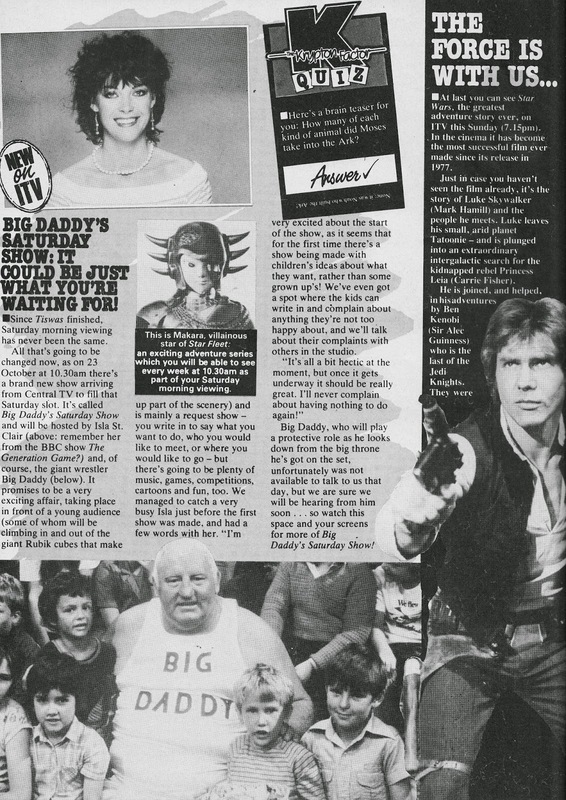 And, if I recall correctly, a latter quirk in ITV's regional scheduling meant I could watch it twice ever weekend. The memory may be cheating but I think Anglia kept it in its Saturday morning slot... but neighboring LWT shuffled it to Sundays... allowing people (like me) who lived on the border of both regions the chance to double-dip. And LOOK-IN also teased the show that never was: BIG DADDY'S SATURDAY SHOW. Central's networked Saturday morning entry for the 1982-83 season should have been fronted by the legendary wrestler. Despite his lack of TV presenter experience. And this show was live. What could possibly go wrong? The improbably-named Shirley Crabtree bowed-out (apparently because of ill-health although I can't help wondering whether someone belatedly concluded that it was a non-starter) at the last moment and the show was hastily rebadged (with a tweaked title sequence) as simply THE SATURDAY SHOW. 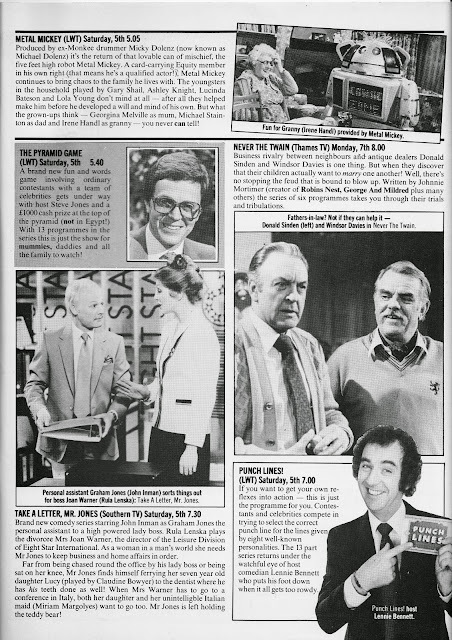 TV mainstay Tommy Boyd was drafted in to anchor alongside the already-booked Isla St Clair (another TV favourite but, again, somewhat lacking in the live-TV-presenting department). It proved a canny move for Boyd. 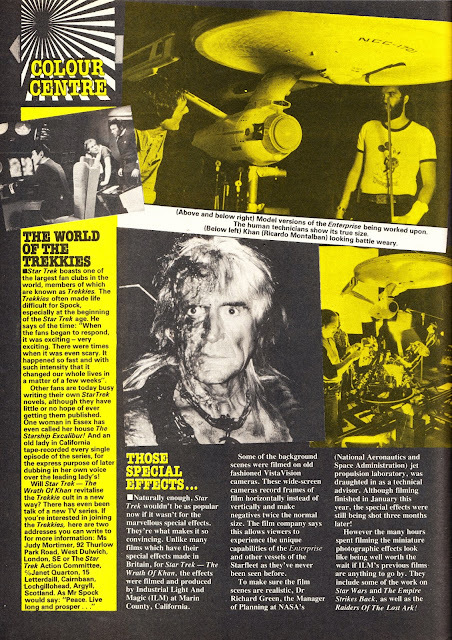 He stuck around for TSS successor SATURDAY STARSHIP (legendary for appearances by Spider-man, Gerry Anderson and - in the finale - the Fink Brothers) and then moved to main presenter duties (and also, apparently, a management role) at TV-am's Wide Awake Club. The following decade he even became the regular presenter of CITV's equivalent of the continuity "broom cupboard". 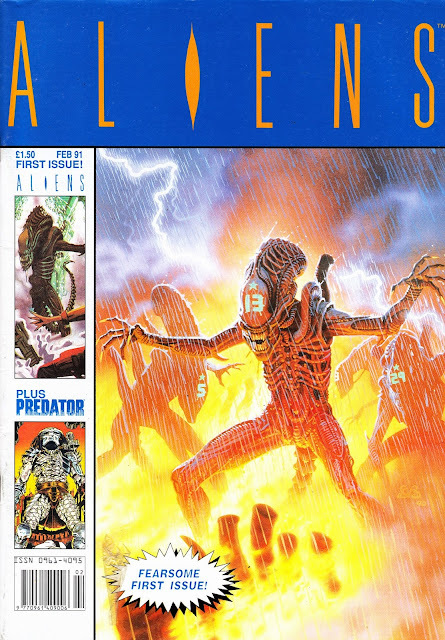 From February 1991: the first issue of the first volume of the British ALIENS comic. This was part of the turn-of-decade mini-boom in more adult comics fare... and had the bonus of two movie franchises (The Predator was also along for the ride) to help shift copies. As you might expect, the contents were from the US Dark Horse run. I read, in one DH title, that these British reprints were unlicensed but it seems unlikely that anyone would risk the double wrath of a US publisher and a major Hollywood studio with a large UK base (in sunny Soho Square) and sister companies with considerable clout and influence within the British media. This first volume ran until DH opened their own (ultimately short-lived) British branch and took responsibility for British editions in-house. 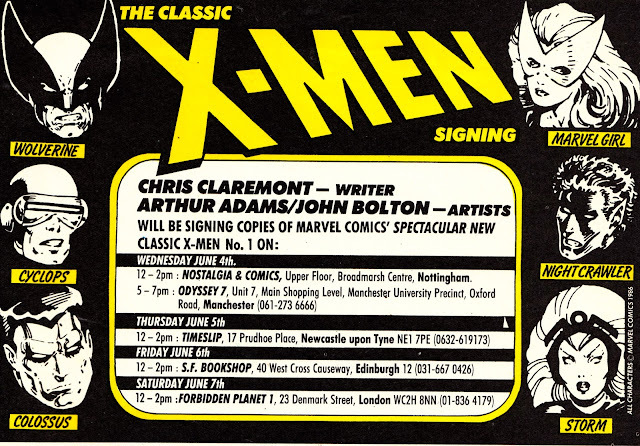 From May 1986: A MARVEL UK House Ad with itinerary details for the Marvel US-organized (apparently as "thank you" overseas trip for the X-creative team) signing tour to promote the launch of the new CLASSIC X-MEN monthly. It's unlikely that a few extra copies flogged in the UK was going to make much difference to the overall sales figures so this was clearly a "working vacation" ruse on everyone's part. This was not the same tour that saw the team appear on TV-am's GOOD MORNING BRITAIN... that took place the previous year. CLASSIC X-MEN, which reprinted the New X-Men strips from a decade earlier, turned into a canny launch for Marvel. It eventually clocked-up an impressive 110 issues through to 1995. It became X-MEN CLASSIC from the 45th issue, presumably to group it alongside the other X-books on retailer paperwork and on the shelves. Those initial four-odd years also included new material (supplementary pages of new art and back-up strips) intended to anchor the past events to current continuity or explore additional facets of the original storyline. "Well hello ladies! I remember these from THE WICKED LADY!" From 1991: The fourth issue of Visual Imagination's long-running (and inspiration to several we-can-do-that-too wannabes) STAR TREK THE NEXT GENERATION OFFICIAL POSTER MAGAZINE. As I've mentioned before, the appeal of poster magazines (other than as a piece of Star Age nostalgia) has always eluded me so I didn't get any of these at the time. I stumbled across this random issue recently and decided to add it to the vaults. 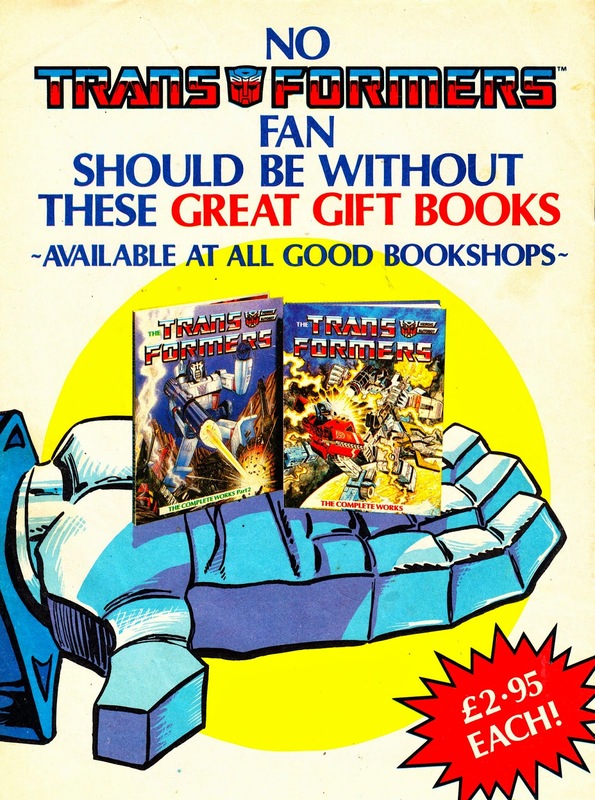 From August 1987: The MARVEL UK House Ad for the two-volumes-and-we're-done THE TRANSFORMERS: THE (Far From Complete) WORKS. As mentioned in posts past, this was a two volume run of hardbacks that, despite their name, only actually compiled (in colour) the initial four-issue US limited series which introduced the giant robots and their universe (actually, at this point, Marvel Earth). The same material (give-or-take) had already appeared in the ongoing series and the two 1985 Collected Comics editions. Whether Marvel had ever planned to extend this range further is unrecorded but it seems unlikely. They even went as far as to commission a new final page of art that left the Autobots triumphant over their enemy. As anyone who remembers reading the shocking conclusion to the strip at the time, Marvel left the limited series on a cliffhanger by suddenly bringing (the daft looking) Shockwave (teased in earlier issues) into the battle and apparently annihilating the Autobots. For a long time, rumors circulated that this page had originally been prepared for the American editions but substituted pre-press, at the last minute, once the green light had been given to continue (after a hiatus) the series. Although in makes a convincing case, the uncredited art doesn't match the rest of the book. 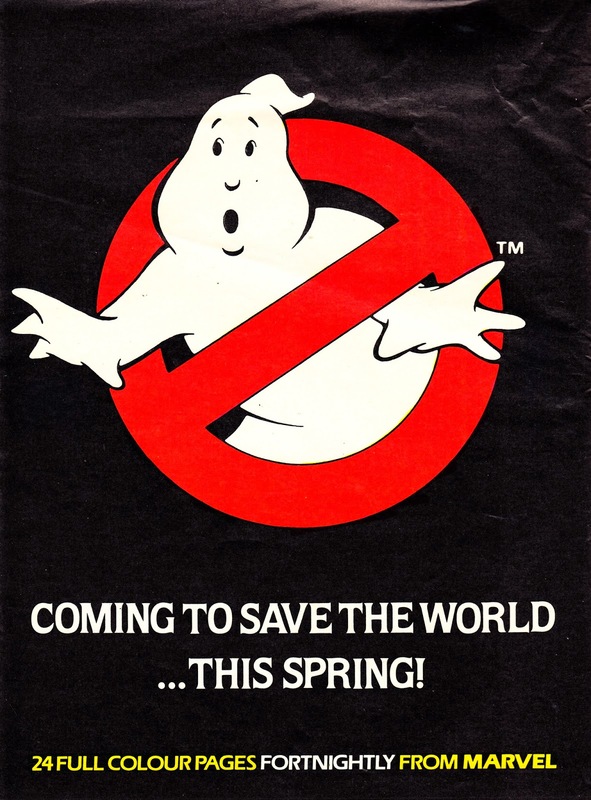 From February 1988: The MARVEL UK teaser ad for the about-to-launch THE REAL GHOSTBUSTERS. It's an obvious design... but also incredibly strong. TRG turned out to be a real cash-cow for the Annex of Ideas. Not only was the core book a runaway hit but it also spun off the traditional Collected Comics and annuals. Marvel also published books, a poster magazine, a best-of monthly and the spin-off BLIMEY IT'S SLIMER monthly and specials. The Big Green Ectoplasm also popped-up in the short-lived all-original humor weekly IT'S WICKED and the Ghostbusters were also mainstays of THE MARVEL BUMPER COMICS anything-goes anthology. 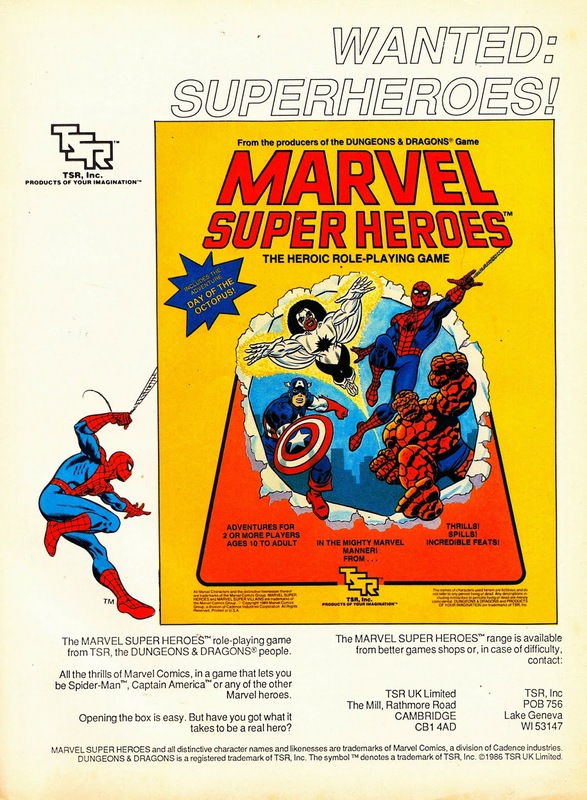 From January 1987: Another in the run of TSR ads for the British release of the MARVEL SUPER HEROES Role-Playing Game. New year: New edition. Although, apparently, not a second edition. This, like the others in the series, was fairly ubiquitous across the core MARVEL UK line (and, no doubt, in Role Playing magazine) at the time. From 1996: The thirteenth issue of Rob Dyer's fanzine DARK STAR. I found this random issue in a store recently. I don't remember seeing this particular issue back in '96 but - prior to that - I have a hunch that the Forbidden Planet branch on London's New Oxford Street used to carry copies when they still had a fanzine section in the basement. Looking back... I wish I'd paid more attention (and had more money) to sample the collective wares. I know very little about DARK STAR so there's not a lot of background or context I can add. 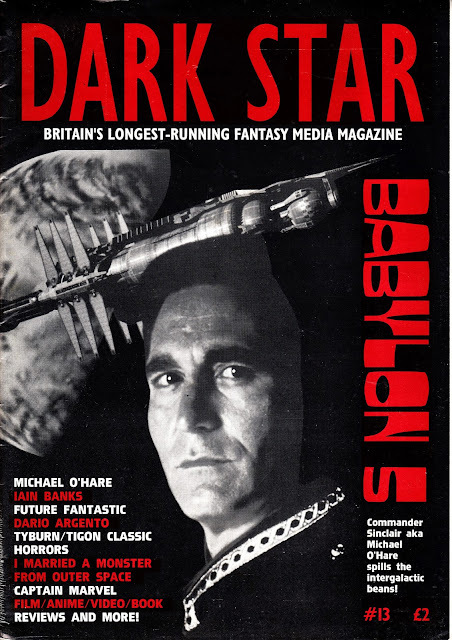 I suspect the cover feature comes off the back of the late Michael O'Hare's visit to the UK after he bowed out of BABYLON FIVE after the first season. I remember him doing the rounds of various stores signing stuff (in these more innocent times he would rock up to one of the organized events and charge a fortune each time he picked up his pen). O'Hare (who, it seems, had a more troubled private life than anyone was privy to at the time) came across as being more relaxed and likeable than he ever did on screen. It was always tricky to know whether his performance was because he saw the character as by-the-book and unemotional or whether he just wasn't a terribly good actor. 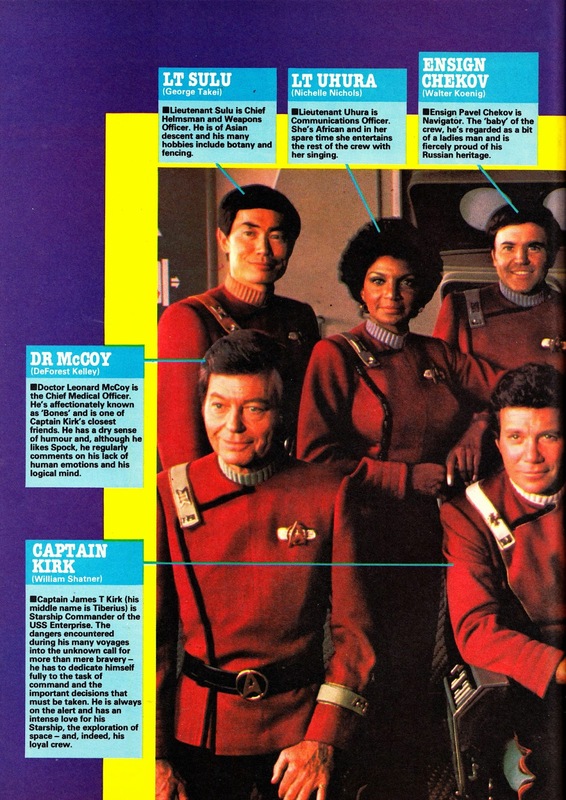 I assumed, at the time, his replacement on the show, Bruce Boxleitner, was drafted in by the studio after season one to raise the show's game. He was a more established acting talent and also able to boost the show's appeal to wavering station managers and groups by parachuting in a known star who had already anchored several network dramas. O'Hare suffered from mental illness for some twenty years but died of a heart attack, aged sixty, in 2012. 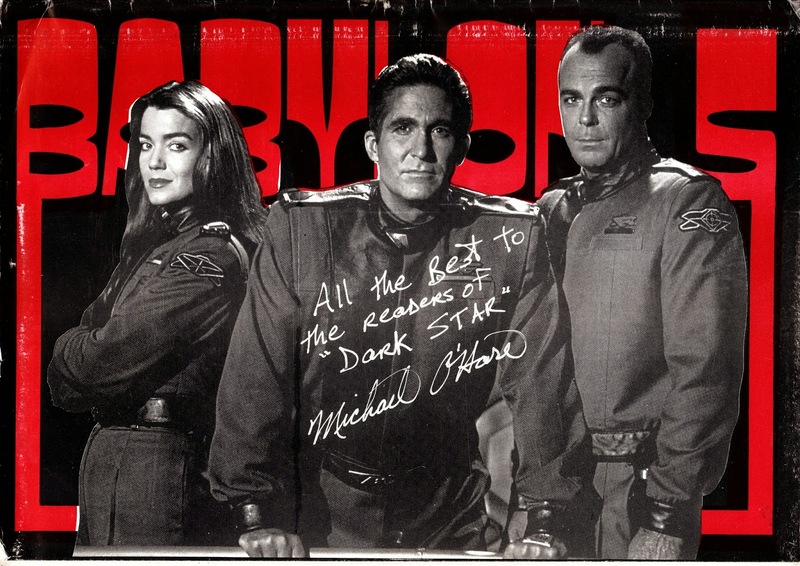 The B5 cast has been particularly cursed and other talented members who are no longer with us also number Richard Biggs (who was only 44 when he died), Andreas Katsulas and Jeff Conaway. 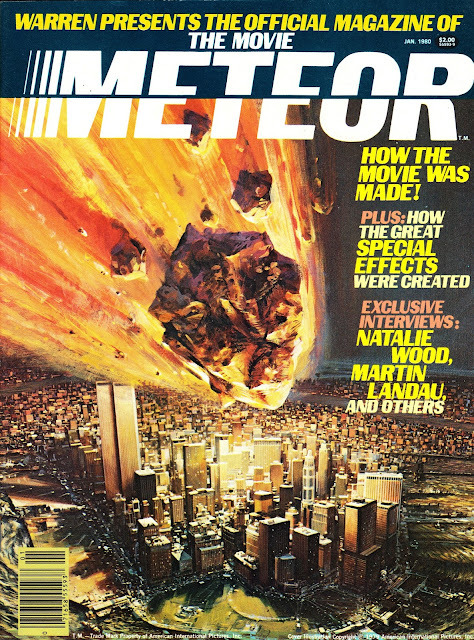 From January 1980: THE OFFICIAL METEOR MOVIE MAGAZINE, published by Warren. I must confess that I have never seen this Seventies Disaster Movie/ SF combo... although, from what i have heard, I doubt it is as spectacular as the magazine enthusiastically suggests. Indeed, I understand it's more akin to a RAISE THE TITANIC stylee clunker. But... I have a copy of the movie on order... so I'll know for sure whether it's a Star Age disaster of a Disaster Movie. UPDATE: I finally managed to see the movie itself this morning and can happily report that it's a worthy addition to the Seventies Disaster Movie cycle and certainly no clunker. The effects are a mixed bag (the plot-critical nuclear missiles look suspiciously like Airfix models), and I vaguely recall that the avalanche sequence (with a prominently-billed Sybil Danning) is lifted wholesale from a Corman flick, but it's still a good little romp. 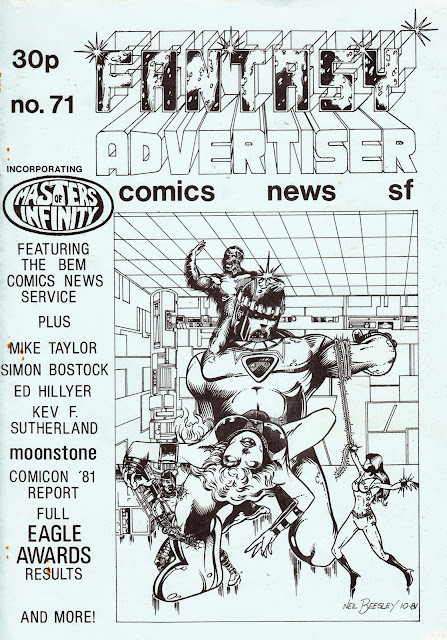 From March 1982: another random-scan from the back-issue box... FANTASY ADVERTISER (Incorporating MASTERS OF INFINITY) Issue 72. 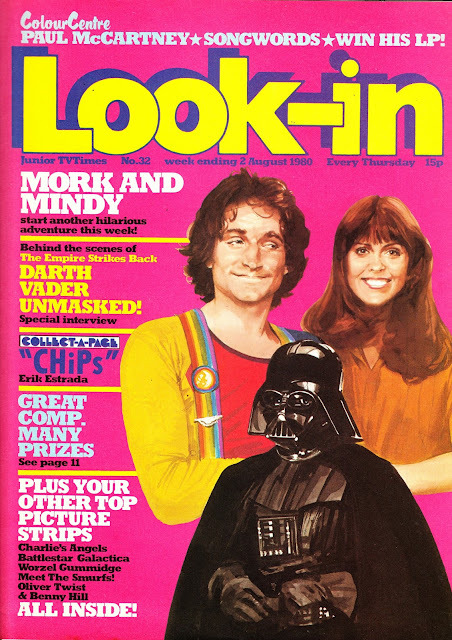 From August 1980: A Star Age line-up that only LOOK-IN could concoct... Mork, Mindy and Darth. It's a shame LOOK-IN were starting to loose interest in the BATTLESTAR GALACTICA strip (it wrapped its year-long run in October)... shoehorning a Cylon into the picture as well would have been the ultimate icon mash-up. 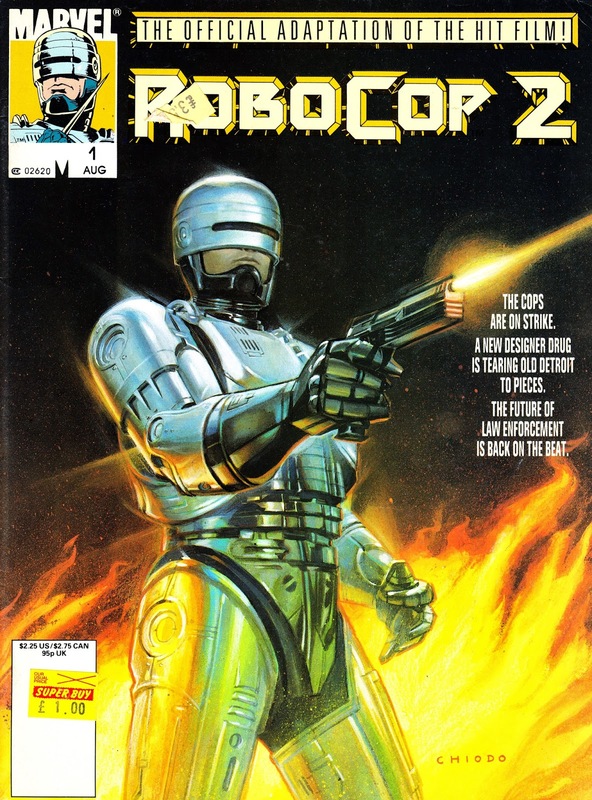 From August 1990: Yet another outing (alongside the bookshelf and limited series versions) for Marvel's adaptation of ROBOCOP 2. Unlike its predecessor, there was no Marvel UK edition. 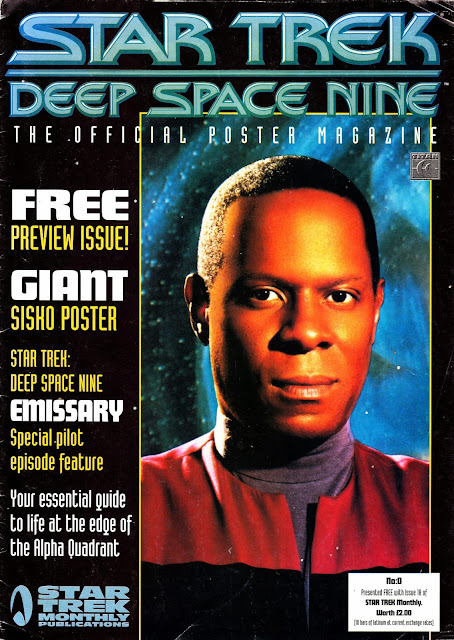 From August 1996: A preview issue, presented free with the regular Titan STAR TREK MAGAZINE (the eighteenth issue) to tease the impending launch of the standalone STAR TREK: DEEP SPACE NINE - THE OFFICIAL POSTER MAGAZINE. Visual Imagination had been publishing a NEXT GEN Poster Mag (a rare dalliance into actually acquiring the license to something) since 1991 so it seems that, by mid-decade, their rivals had started to notice and launch their own "me too" incarnations. Titan had this and Marvel had their DOCTOR WHO and BLAKE'S SEVEN versions. Titan had dabbled with a spin-off STAR TREK GENERATIONS poster magazine in 1995. It ran for four issues. The format was the usual features on one side/ giant poster on the reverse formula. 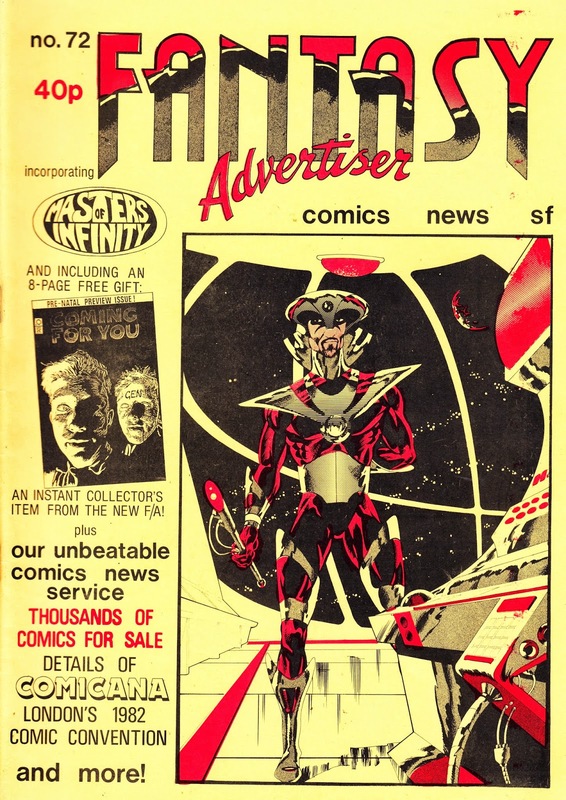 Only fourteen regular issues appeared before Titan called time. Presumably sales didn't amount to much or the costs or terms of the license, going into the second year, changed or were too great. It was edited by the ubiquitous John Freeman. From July 1987: a MARVEL UK House Ad for the (ultimately short-lived) ACTION FORCE weekly. From November 1986: A MARVEL UK House Ad for the first (of 6, published 1986 to 1991) THUNDERCATS ANNUAL and the second (of seven, published 1985 to 1991) THE TRANSFORMERS (Generation 1) ANNUAL. The Transformers edition featured all-new material. The Thundercats book reprinted the origin story (an adaptation of the "oh-look-they're-naked" pilot episode of the animated show) from the first issues of the US Star Comics run. The Thundercats book went on sale ahead of the Marvel UK ongoing comic (which launched the following March) and the TV itself. BBC ONE aired the first episode on 2 January 1987 at 4.55pm. The Thundercats material was subsequently reissued in another M-UK hardback: THUNDERCATS: THE ORIGIN. 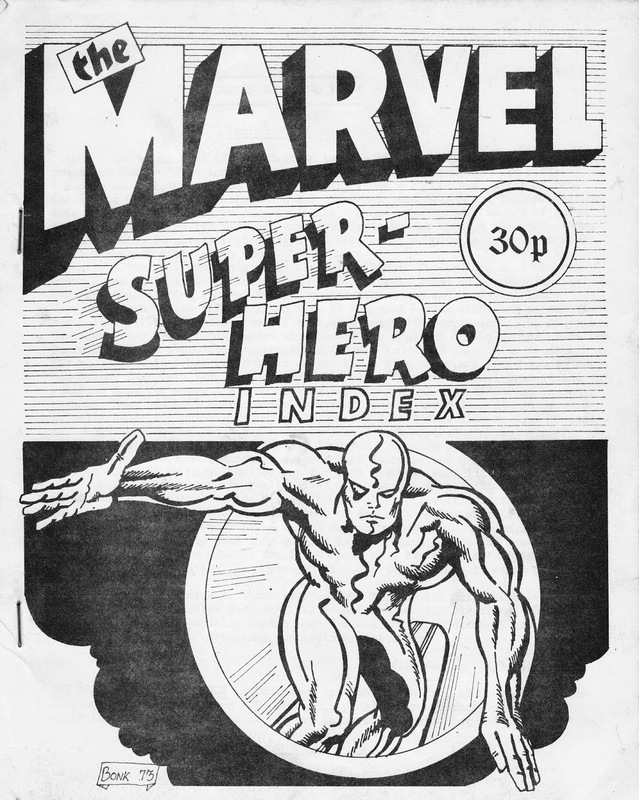 From March 1974: THE MARVEL SUPER-HERO INDEX, published by Alan Austin. Remember when the Marvel Universe was a far more simple place? With only a decade of appearances and (relatively) coherent internal continuity? This British produced guide is a throwback to that time. I found it in my local comic book store recently. I've also been picking-up various Marvel first issues lately, often from the 1990s (the impending volume in their nice series of FIRSTS trade paperbacks has suddenly switched from overpriced trade (as per the previous versions) to £100 hardback whopper... which means its cheaper to raid the 50p boxes. And, the book still only has a smattering of the myriad of launches from the time), and it struck me that indexing and cross referencing the 1990s would be a heck of a lot more complicated than tracking Marvel's first ten-or-so years. And today's relaunches and reboots just leave me thinking "meh". 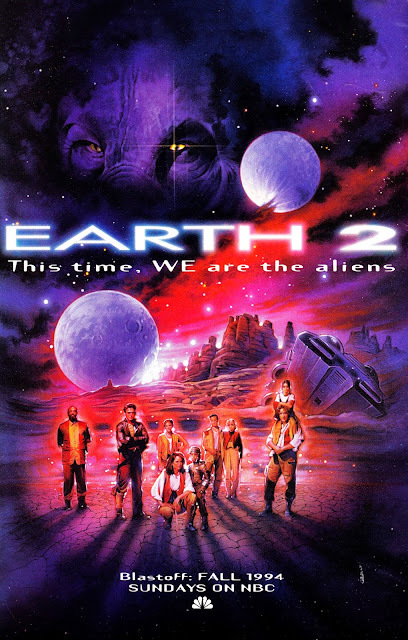 From 1994: the print ad promoting the launch of EARTH 2, the big-budget NBC space drama that - ahem - went nowhere. This was, essentially, the old Western standby of a settler family battling against the odds to build a new life in essentially hostile territory. The twist being that this was, of course, another world. So far, so average. And when I watched a couple of episodes way-back-when (it aired on either SKY ONE or the short-lived SKY TWO over here) I could find little to hook me in. It was certainly less campy than LOST IN SPACE... but that didn't make it good fun. The cast, however, had a few standouts. The excellent Debrah Farentino (oh so good in the brilliant EZ STREETS) took the lead, beating ST: VOYAGER to the prize of having a female commanding officer by a couple of months. The always-compelling Tim Curry also had a recurring role. Another familiar faces on the roster were Terry O'Quinn, Roy Dotrice and Richard (MAN IN A SUITCASE) Bradford. The first-and-only season of 22 shows is now on DVD. From October 1995: the first issue of Visual Imagination's CULT TIMES magazine. This was a pretty nifty idea (although not well executed) that took advantage of deregulation of TV listings, the abundance of satellite channels and the tons of new and old cult fare they used to pad their schedules. The bulk of each issue was devoted to a comprehensive run down of any programme deemed "cult" on satellite TV for the month ahead, presented (with a little more detail) in the style of the RADIO and TV TIMES as well as the copious number of dedicated satellite TV listings magazines from the pre-EPG era. The flaw with the plan was, however, that satellite and cable TV penetration was still pretty low (making this, for many, more of a what-I-would-watch-if-I-could/ what-can-I-get-my-mate-to-tape guide) and the terrestrial channels (who were also stuffing their off-peak schedules with SF/ Fantasy shows) still only released their schedules a week ahead of TX, forcing the editors to assume ongoing series would continue as planned (always a dangerous assumption) and completely omitting any premieres, one-offs or schedule changes that the Press Office had neglected to mention in adavance. Looking at these listings now, it's obvious how much better TV was in the mid-Nineties. Nostalgia alert. The schedules seem to be packed with cheap-to-show Star Age series which have now largely been banished to the DVD shelves. The rest of the magazine always looked like it was cobbled together on a wet Wednesday afternoon with indecent haste. Visual Imagination's titles were often more style (read: big glossy stills) than substance but the feature material herein was always conspicuously sleight with the minimum of information presented in the largest possible font. The cover displays North American prices but overseas readers would have found CT next-to-useless. As with all of the VI line, it subsequently became obsessed with THE X-FILES ans seemed to load each issue with at least one photo-heavy article (and, ideally, the cover as well). 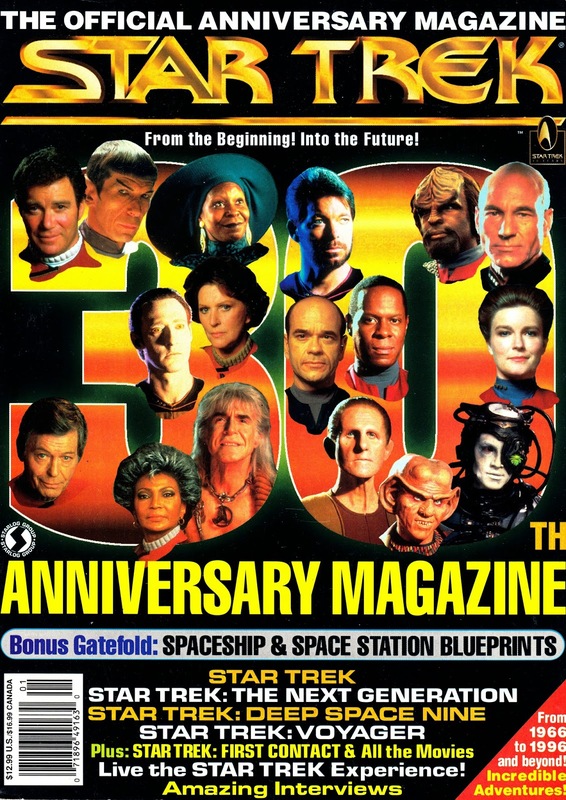 The last issue featured on Visual Imagination's website (which is, surprisingly, still running even through the company collapsed in 2009) is issue 159, covering December 2008. 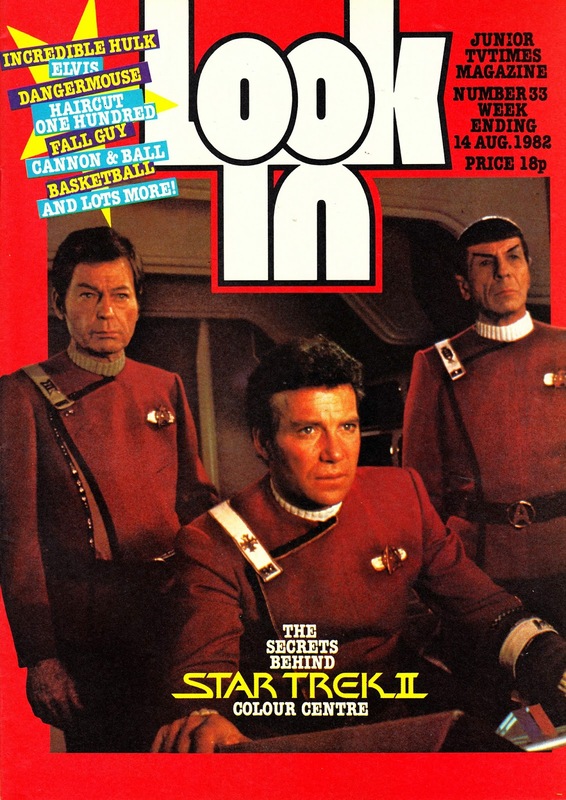 From August 1982: LOOK-IN boldly goes again with a cover and four-page centre spread devoted to STAR TREK II: THE WRATH OF KAHN. 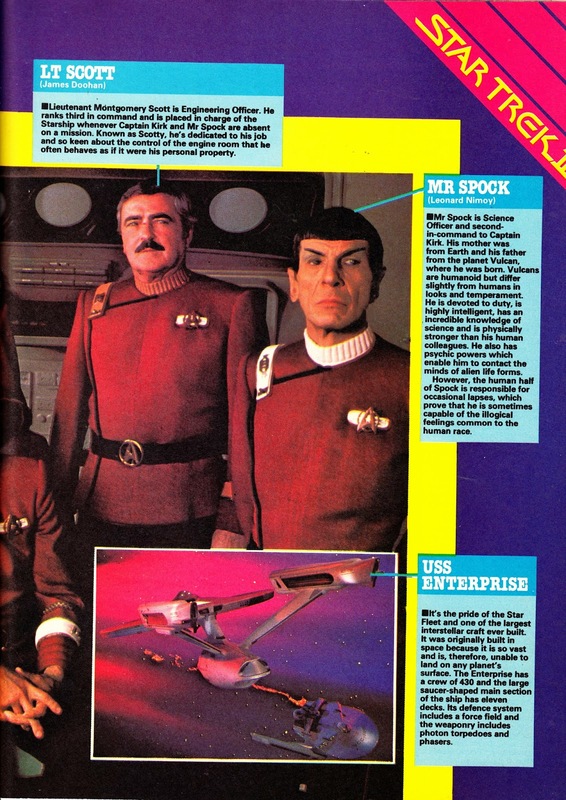 Trek was still a BBC show throughout the bulk of the Eighties (they renewed the rights to the whole package at the end of the decade... and promptly shared them with Sky) but ITV's LOOK-IN wasn't averse to covering the new movie releases. It probably helped that ITV owned the rights to the movies... although the gap between theatrical and TV premiere was around three years! From January 1982: Issue 71 of the British fanzine FANTASY ADVERTISER. 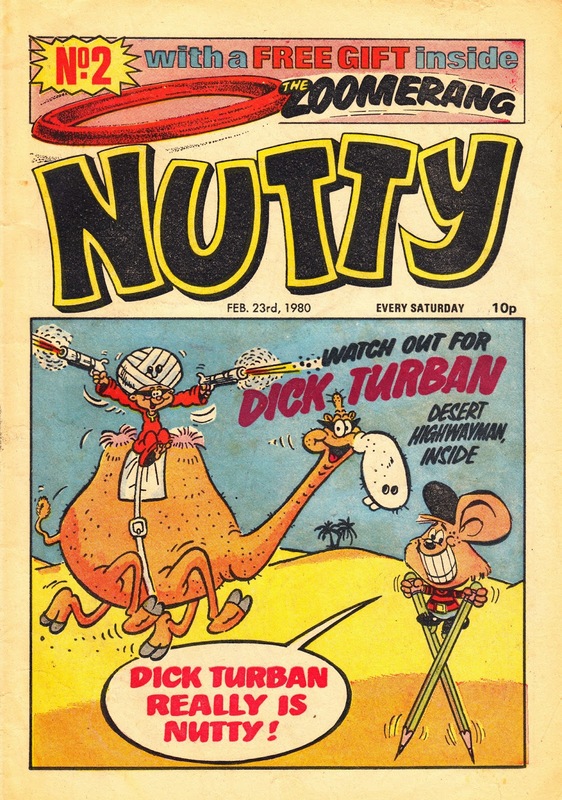 From February 1980: the second issue of NUTTY weekly. The DC Thomson humor comic ran for 292 issues before merging, in September 1985, with the DANDY. The relatively swift failure was all the more surprising because Nutty featured BANANAMAN (clearly not initially the title's breakout star judging from his conspicuous absence on the cover) , the iconic spoof superhero who'd already graduated to his own BBC animated series (reuniting the vocal talents of the Goodies) in October 1983 (and, as per the BBC tradition, continued to be a regular fixture of the afternoon schedules for years to come). This issue continued the great British comics tradition of giving away spinners/ frisbees as freebies. From April 1983: LOOK-IN, and E.T, go 3-D! IPC's EAGLE had already embarked, back in February and March, on a four-week 3-D binge and, no sooner had that promotion ended (with the issue dated 19 March), LOOK-IN followed fast behind with the issue on sale in the last week of the month. 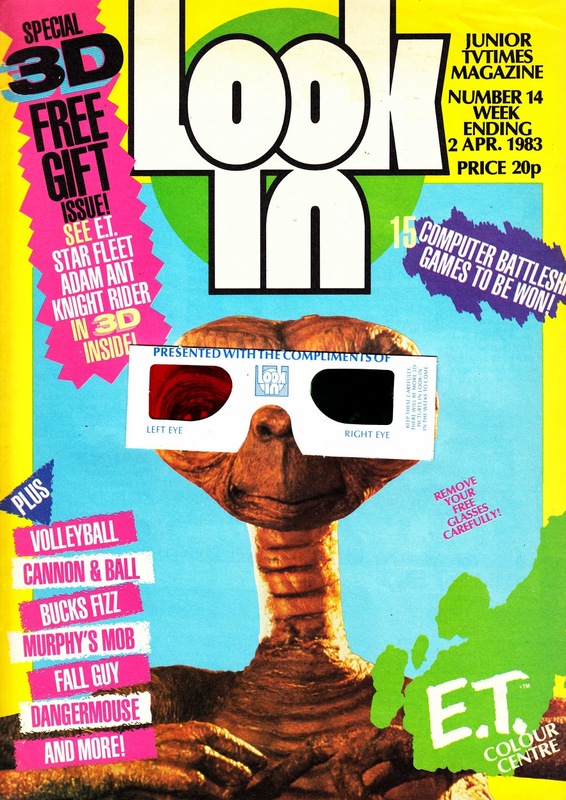 I've always loved the way the designer (and all the bods paid to tape the specs to the cover) incorporated the glasses into the cover's layout. It's very effective and, ahem, eye-catching. Unlike the big E, Look-In restricted the 3-D material to the features pages, depriving weekly followers of the Bucks Fizz strip the chance to see their pop-tastic heroes rendered in an additional dimension. E.T was already approaching the first anniversary of the film's US release (11 June '82) but had only reached the UK the previous December and would have still been doing the rounds of British cinemas in March/ April. 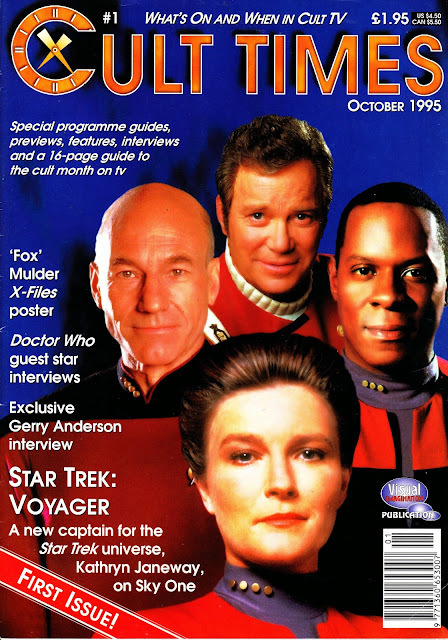 From 1996: STARLOG celebrates the thirtieth anniversary of the launch of STAR TREK with this one-shot magazine. From back in the day when the deep space franchise could still support multiple regular magazines and one-shots from Starlog, Titan, the Official Fan Club and other publishers (plus regular coverage in the likes of TV ZONE and DREAMWATCH and lawyer-baiting unofficial mags too). 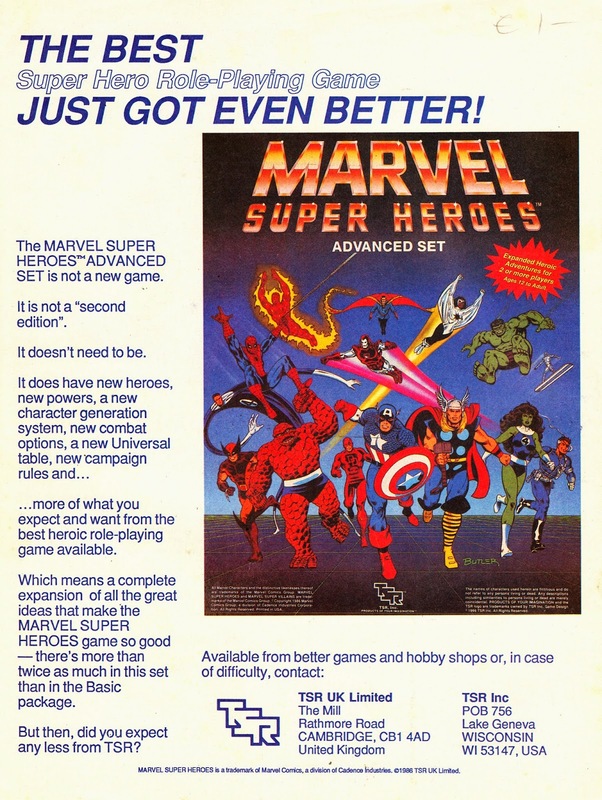 From November 1986: Another British advert, from the MARVEL UK weeklies, for the MARVEL SUPER HEROES Role Playing Game from TSR. 1986: MARVEL UK TREASURY EDITIONS/ COMPLETE WORKS House Ad. 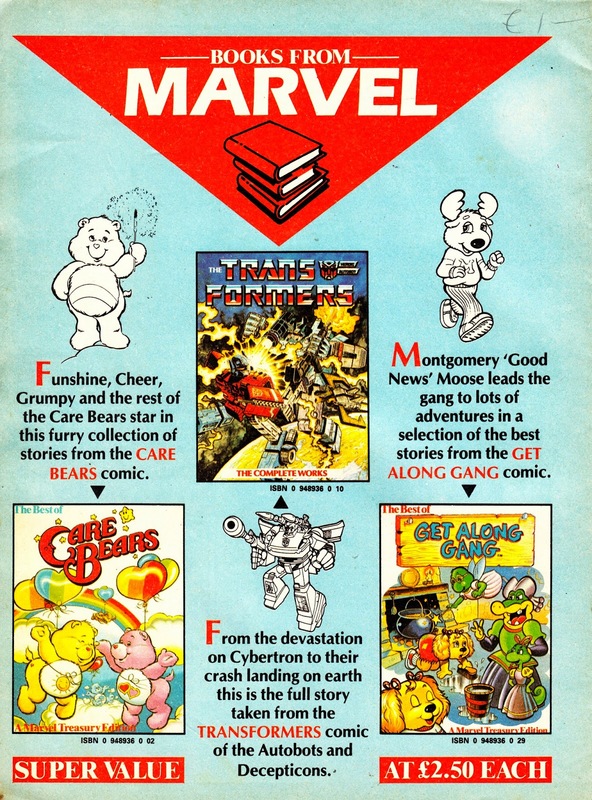 From May 1986: A MARVEL UK House Ad for the first three releases in the hardback TREASURY EDITION (not to be confused with the oversize tabloids of the past) line. These were sold in book stores/ departments rather than alongside the regular comics so, despite heavy plugging in the core line, were easily overlooked. The two younger-reader entries, THE CARE BEARS and THE GET ALONG GANG, recycled material from the respective weeklies. THE TRANSFORMERS: THE COMPLETE WORKS (something of a misnomer as it only reprinted the first two issues of the initial US limited series) is the one most likely to resurface today. 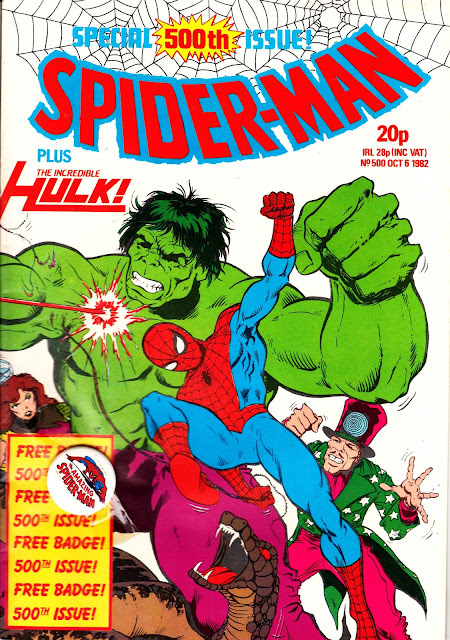 It recycled the specially-commissioned cover art from the first UK issue, based on the toys rather than the more commonly used animation model sheets from Marvel Productions (they reached New York after the first issue of the limited series was already completed... and took far longer to reach Redan Place). The contents would already have been familiar to anyone who'd read the first four issues of the fortnightly or the first (summer 1985) Collected Comics edition. The latter, and this hardback, had the advantage of presenting the material in colour (the fortnightly, after the first issue, was a mix of colour and black & white interior pages) and with the pages in the intended order. The British Bullpen sliced the meet-the-Autobot-team double-page spread (an invaluable reference tool) out of the main strip and made it the centre-page poster in the second issue. A second edition of THE TRANSFORMERS followed... but we'll get to that. As well as being Marvel weeklies, all three had something else in common... their animated counterparts were all part of TV-am's early morning schedules. From August 1980: A one-page WH SMITH (love the old 'box' logo... still on the doors of the Cardiff branch... and no doubt throughout the chain with notoriously threadbare carpets and weather-worn stores) advert promoting Corgi and Matchbox toys. 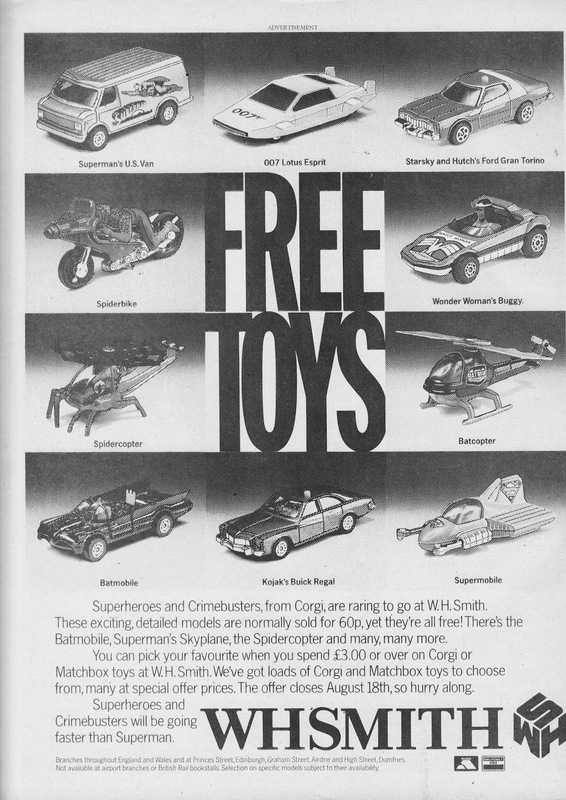 There's a lot of classics on show here, all of these were playground staples in the Star Age and I personally had (and may still have... tucked away in a loft somewhere) the Superman van (and a pink Charlie's Angels variation), the James Bond Lotus, the Wonder Woman buggy (containing a butch-looking WW whom my mum compared to a "Red Indian"), the Batmobile (hard to believe the TV show was already a decade old at this point but ownership of the toy was still a playtime prerequisite) and - best of all - the Supermobile (as plugged in the comic book itself) with spring-loaded "punching fists' feature. This advert appeared in a copy of LOOK-IN. 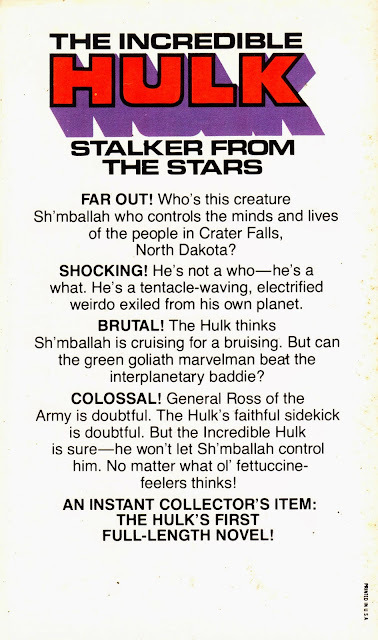 From 1978: THE INCREDIBLE HULK prose novel STALKER FROM THE STARS by Len Wein, Marv Wolfman and Joseph Silva. Published in the States by Pocket Books. I picked this up recently and (typically) I've not had a chance to read it yet. But it looked too much fun to pass up on. 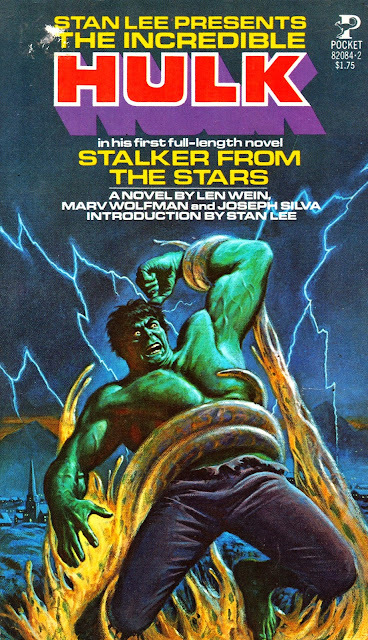 The timing hits the peak of the TV show's success but a swift bit of Googling reveals this is actually one of a series of eleven Marvel Superheroes novels, all apparently published during 1978-79. The Green Goliath appeared solo in two of the thirteen and teamed up with Spider-man in a third. He was also one-fourth of an anthology edition with four shorter stories (also starring Daredevil, the Avengers and the X-Men). The Web Slinger also starred in two books (and shared that billing with the Hulk on a third). Other volumes featured The Avengers, Doctor Strange (star of a TVM around this time), Captain America (ditto. Times two), the Fantastic Four and Iron Man. 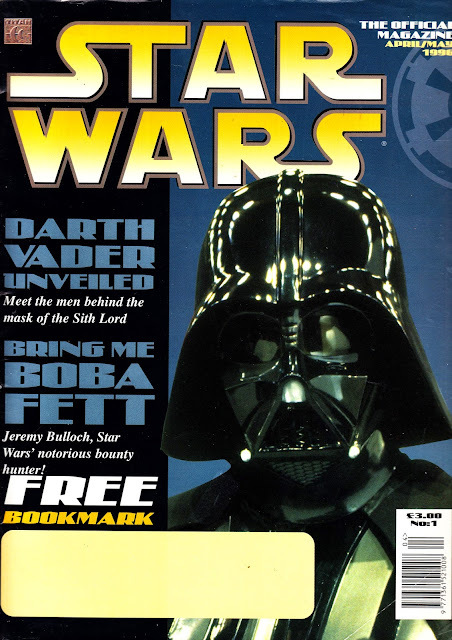 From April 1996: the first issue of Titan's (slightly too wide for my scanner) STAR WARS The Official Magazine Issue 1, edited by John (done a lot) Freeman. Titan continues to publish this one (as STAR WARS INSIDER, a masthead previously used by the Lucasfilm Fan Club in the days of multiple mags, all officially licensed, from different publishers), although (like its STAR TREK companion) it looks to have endured a few budget cuts over the years as the word count seems to have dipped in favor of more photos and illustrations. One long-gone feature of the earliest issues (and, I have no doubt, borrowed from the DWM 'successful magazine file') was a comic strip component. This issue kicked things off with a serialized reprint of Dark Horse's solo Boba Fett adventure Bounty on Bar-Kooda (from Wagner and Kennedy). 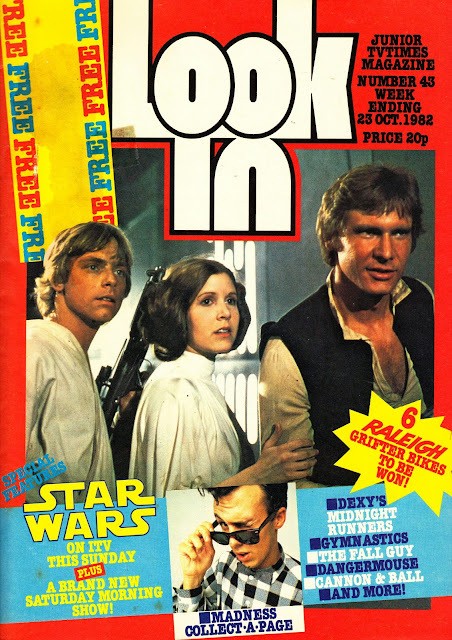 The magazine has continued to cover new developments in the SW universe over the years but it remains to be seen whether the arrival of the new films (and, no doubt, tweaks to the deals with existing licensees) will have any impact on the magazine other than, of course, comprehensive coverage. Titan branched out with a SW comic, launched to coincide with (puttup!) THE PHANTOM MENACE, reprinting assorted strips from the States. I *think*, over time, that shifted tack to tie-in with the various animated series. 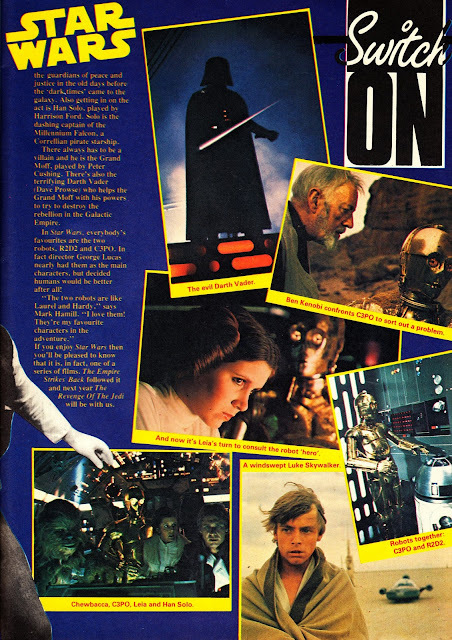 They also had a punt at STAR WARS GALAXY, a Panini Collectors' Edition-alike companion to their DC reprints. It didn't fare well and is now defunct. 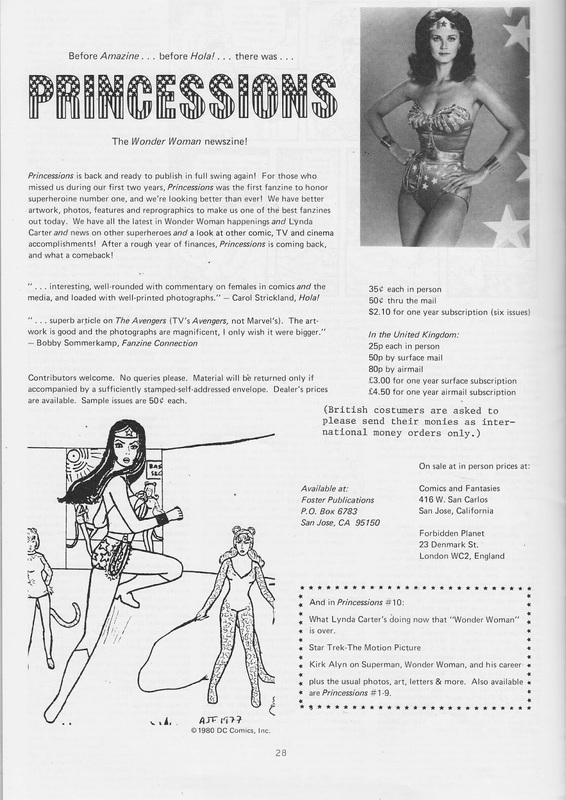 From 1980: a full-page advert to sign up for PRINCESSIONS: The Wonder Woman newszine which also (smartly... considering the show was defunct) seemed to cover plenty of other topics too. Did anyone read or contribute to this? Does anyone have copies? Any good? Copies were apparently sold in the original FP down Denmark Street way. From April 1986: a full-page, landscape-orientated plug for the TSR MARVEL SUPER HEROES RPG in the form of a DAILY BUGLE front page. This ad ran heavily in the MARVEL UK line. From December 1986: a double-dose of MARVEL UK giant robot goodness: side-by-side (or, more accurately, stacked) House Ads for the TRANSFORMERS: THE MOVIE POSTER MAGAZINE and the one-and-only ZOIDS ANNUAL. The Poster Magazine (reviving an old publishing tradition, occasionally indulged by the Annex of Ideas) was a giant version of the stunning key advertising art with, if I recall correctly, a summary of the movie on the reverse illustrated by cells/ stills from the animation. 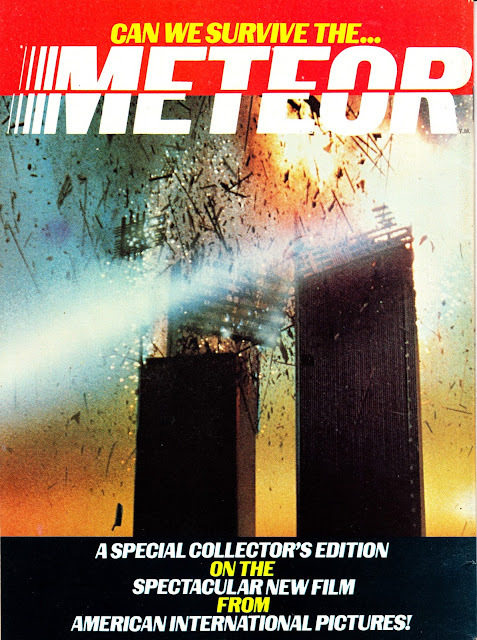 M-UK also reprinted the three-issue movie adaptation in a done-in-one album-format special. 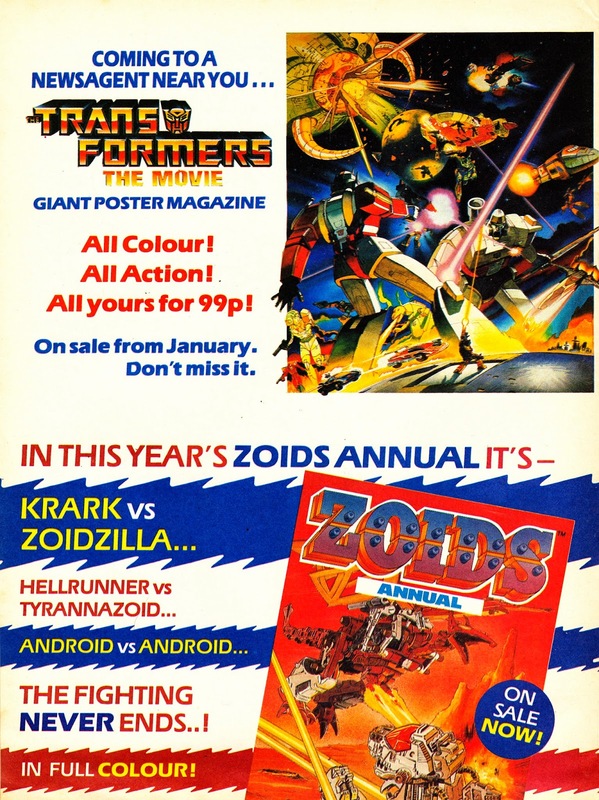 The Zoids Annual was a spin-off from SPIDER-MAN AND ZOIDS weekly (Spidey also had his own annual... I'll post the House Ad for that soon) with all new material. At this time, the Bullpen were canny (or foolhardy) enough to tie the yearbooks into the ongoing continuity of the comics making them even more of a must-have for regular readers. Proof positive that the CBS live-action SPIDER-MAN TV show took its sweet time (delayed by the feature film versions) to cross the Atlantic... the announcement of its impending arrival on ITV from LOOK-IN. 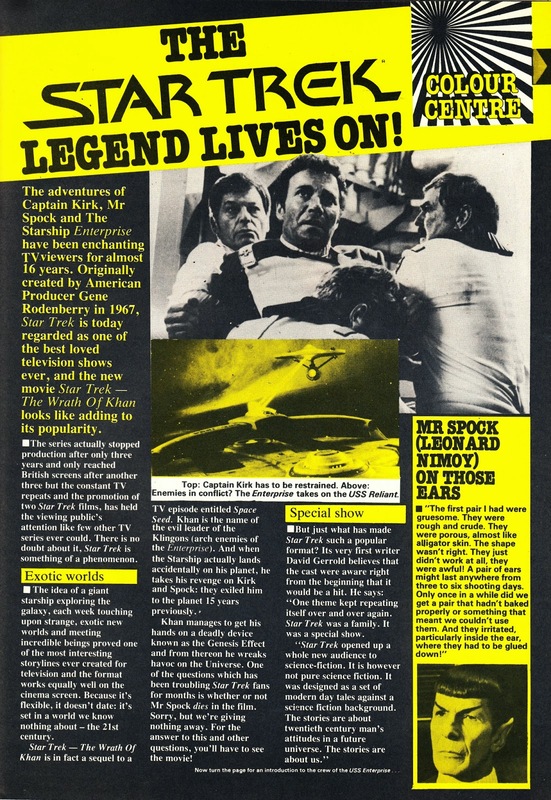 It was usual practice for LOOK-IN to publish strip adaptations of any pre-watershed (ruling out THE PROFESSIONALS) shows deemed of sufficient interest to its readership and not already licensed to another title (which didn't seem to stop them doing their own versions of BATTLESTAR GALACTICA and THE A-TEAM) which would have made Spidey a shoe-in. Except, of course, Marvel UK had those rights all stitched up. 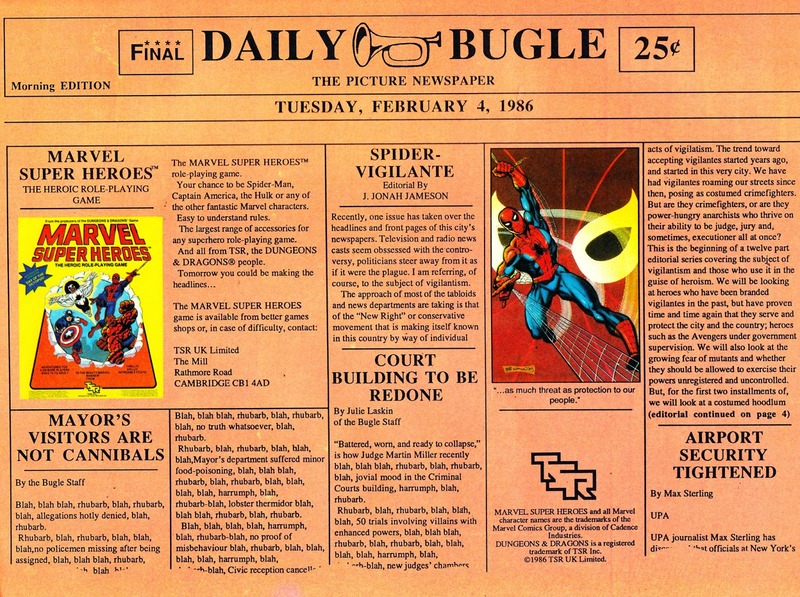 The long-running weekly changed its name (SUPER SPIDER-MAN TV COMIC) and format (glossy front-and-centre spreads) to make the most of the marketing moment. 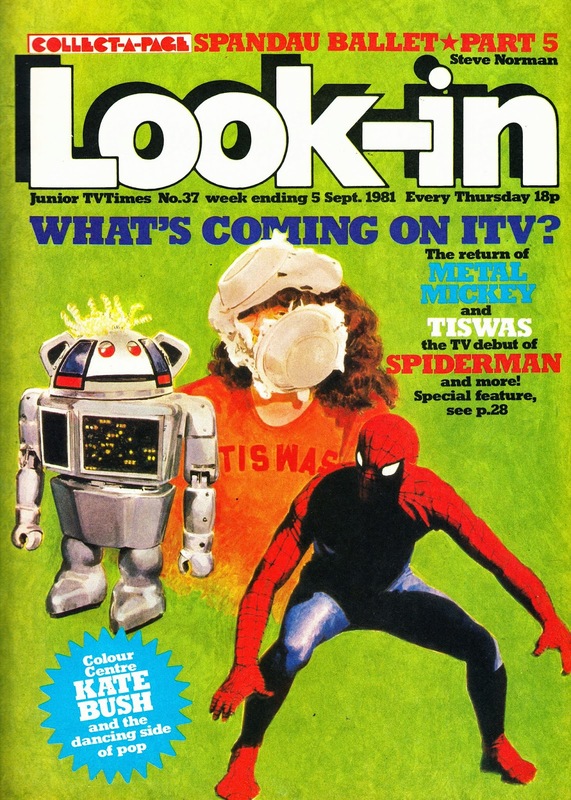 Other highlights of the new ITV season (LOOK-IN was, of course, published by ITV Publications... owned by the regional ITV companies principally to publish their listings in TV TIMES magazine) included METAL MICKEY (another show that, for different reasons, never secured a comic strip slot herein... although the editors were confident enough to announce its impending debut. It went to TV TOPS instead) and John Inman in TAKE A LETTER MR JONES. Sadly LI readers were deprived of the chance to read a weekly dose of comic strip campery as well. This was also the last issue to feature the often stunning artwork covers (notable for some very odd combinations of cover stars depending on who was featured on any particular week) that served it so well throughout most of the Seventies. The following issue switched to the photo-covers that continued for the rest of the mag's long run.